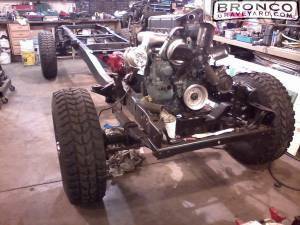 1976 Ford F-250, 4X4 Highboy, Crew Cab, Long Box. 4 cylinder 53 series Turbo & SuperCharged Detroit Diesel, 3.5-4" straight pipe exhaust, 4 speed NP435, auxiliary 3 speed Spicer 5831, twin stick NP205, 4.10 Dana 60's 24 forward & 6 reverse gears. Completely rebuilt from the ground up, so far 2 1/2 years, 1 year more to finish.